The death toll in a coal mine explosion in Colombia increased to 18 Friday with the early morning recovery of two more bodies, a state government spokesman said. Fifty-three miners remained missing, and one was being treated for burns, said Juan Fernando Ortiz, spokesman for the Antioquia state government. 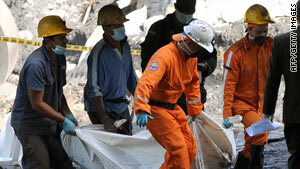 The explosion at the San Fernando mine occurred Wednesday around 10:45 p.m. local time (11:45 p.m. ET) in the city of Amaga, in northwestern Colombia, said Gov. Luis Alfredo Ramos Botero. The first of the dead miners were buried Friday. Hope for the trapped miners had dimmed by Thursday afternoon, less than 24 hours after the explosion. “Because of the explosion, it is considered very improbable” that they survived, Ortiz had said Thursday. Relatives of those still missing seemed to agree. “There’s no hope of finding them alive,” Dora Sanchez said on CNN affiliate Caracol TV. Her husband had not wanted to go to work Wednesday, Sanchez said. A survivor described the powerful blast, which officials said was caused by an accumulation of gas. The explosion occurred during a shift change, increasing the number of miners at the site, said Catalina Rico, a spokeswoman for the Antioquia Disaster Prevention and Attention System. Rescue and recovery operations could take three or four days, Ortiz said. Authorities had temporarily stopped rescue efforts Thursday due to concerns over an accumulation of gas. Colombian President Alvaro Uribe will visit the disaster area Saturday and meet with family members, he said on the presidential website. “There is immense pain,” Uribe said at a news conference Friday, according to the website. Photo: Workers remove a victim’s remains from the mine in the municipality of Amaga, Colombia.